Living a Fit and Full Life: Head Back to School with God Bless My School by Hannah Hall! Head Back to School with God Bless My School by Hannah Hall! These cuddly critters have got their school supplies and are ready for big adventures! Help your own little learner look forward to exciting activities and new friends and—most of all—remember that God is with them everywhere they go. 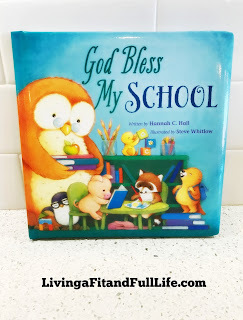 Head back to school with God Bless My School by Hannah Hall! With back to school season in full swing, there's no better time than now to sit and read this perfect book for little ones. God Bless My School by Hannah Hall is a terrific book to help little ones prepare for heading to school. This book is a wonderful book to help little ones look forward to exciting activities and new friends. I also love that it helps them remember that God is with them everywhere they go. 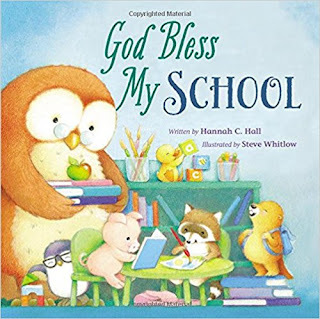 God Bless My School by Hannah Hall is an adorable book with adorable illustrations that my family and I absolutely love! You can find God Bless My School by Hannah Hall on Amazon, Barnes and Noble and other bookstores.